KoolaSun Sun Protection products and Vitamin Enriched Anti-Oxidant Sunscreen Manufacturer. Suntan lotions and sunscreen's of unsurpassed quality at affordable prices are proudly manufactured by KoolaSun. 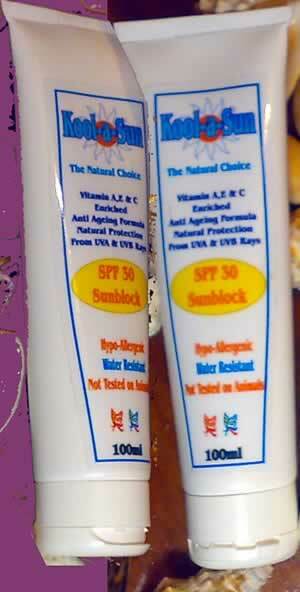 Wholesale and Bulk supply of our standard or customer specified sunblock. Packaging can be customised as to your requirement. Kindly browse our website for information on Sun Protection and information on skin damage caused from exposure to the Sun. We aim to provide the most competitively priced sun screens, sunblock and suntan lotions. Our standard sunscreen's are all enriched with the anti-oxidant properties of Vitamins A, C and E.
In our sun skin care products we have tried to eliminate a cocktail of hazardous chemicals were possible, yet ensure maximum skin care and skin protection from sun exposure. The main UV blocking ingredient in our Sun Cream product is Rutile ( Titanium Dioxide ) and Zincite ( Zinc Oxide ) both are naturally occurring clay-like mineral components of most soil. Thanks to the advent of Nano-Technology the minerals leave a transparent coating on your skin, ensuring broad spectrum UV A and UV B sun protection, without white streaks and marks on your body or clothes. Other Organic UV absorbent Chemicals are added for there water resistant qualities but we keep there usage to a minimum, in order to provide you with as natural a product that is possible, while still protecting you to sun exposure. The sunscreen base is a vitamin enriched moisturizing cream giving added benefit by providing after sun skin nourishing effects. Our policy is as few chemicals as possible, to stick with our philosophy of as natural as possible. Our Sunscreen is formulated to be Hypo-Allergenic and is fine for daily use. All our products have been thoroughly tested on human volunteers, we do not endorse or utilise testing on laboratory animals. Our products have been verified by an independent laboratory as to Sun Protection Factor, and have had dermatological tests performed on them as to ensure minimal side affects. As with most skin products it is recommended to test product on inner wrist for any (unlikely) side effects. Our Sun Skin Care Products are extremely unlikely to cause any skin re-actions or side-effects and have successfully been used at many Nursery Schools in their sun awareness campaigns. Worldwide most Skin Cancer Association's Recommend a Broad Spectrum SPF Factor 20 or Higher Sunscreen. CANSA only supports broadspectrum sunscreen SPF20 or higher. If you want a tanned look it is suggested to use fake tan products to avoid sun related skin damage. We can supply Suntan Lotion/Sunscreen's with various SPF's ( SPF 30+ or SPF 40 is standard ) in various size pump top containers or tubes and can also supply bulk 25 liter refill buckets for nursery schools and other institutions were cloakroom dispenser's are used. Copyright © 2005 - 2009 KoolaSun . All rights reserved.